The high-end home-goods retailer struggled last year as sales and profits flatlined. Shares of Williams-Sonoma (NYSE:WSM) tumbled 17% last year, according to data from S&P Global Market Intelligence. The stock was afflicted by a slowing profit growth as a number of luxury retailers including peer Restoration Hardware had down years as well. As the chart below shows, the stock had a volatile year but trended down for much of it. Through the first three quarters of the year, Williams-Sonoma's revenue has increased just 1% and net income is down slightly, though earnings per share is up by a penny due to share buybacks. CEO Laura Alber said uncertainty in the retail environment weighed on the company's most recent earnings report, but added that it's focused on what it can control such as reducing inventory and lifting gross margins. The lack of investor confidence in the company became vividly clear on Dec. 22 when the stock fell 8%. There was no news out on the company. The stock simply dropped on investor nervousness about the retail holiday, but Williams-Sonoma fell much farther than most. Two other down streaks sealed the stock's fate last year as it plummeted to start the year along with the rest of the market and then in May during the run-up to its first-quarter earnings report, although it ultimately beat expectations. Unlike most retailers, Williams-Sonoma now derives more than half of its revenue from e-commerce but growth in online sales hasn't been strong enough to make up for declining retail sales. E-commerce revenue is up just 3% this year. West Elm remains strong with double-digit comparable brand revenue, but Pottery Barn has been declining significantly. The company makes nearly half of its profits in the fourth quarter so its next report will be crucial. With the economy expanding, performance should be improved, but it isn't. That could be a warning sign for investors going forward. 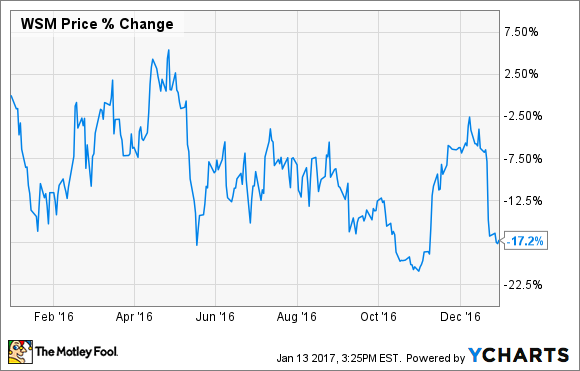 Should You Buy Williams-Sonoma for Its 3% Dividend Yield?